I received the vehicle on June 11, 2014 in very good conditions. I am very thankful for the excellent service rendered by your. I hope to negotiate with your other vehicles in the future if God wants. I am happy to inform you that I received the Nissan X-trail in good order. We have had it for a week now. Thank you so much for your excellent service. The car is in good condition, just like you said. I am happy that you do not compromise with quality. I look forward to ordering from you in the future, and will definitely recommend you to my friends, colleagues and family. I hope you are well. I received the Subaru this morning and just want to let you know that its really good! My colleagues are wondering how I could have managed to find a car in such a uniquely good condition. I'm grateful for your support and I hope we can do business toegther again in the future. 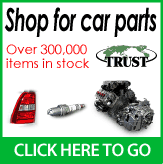 I will surely recommend Trust Company to whoever may be looking for high quality used cars. we received all the documentation and the car car too. it was easy and smooth no hassle. you guys are professional in your work. Am looking forward doing business with you in the future.Thanks a lot. It is just to inform that I received the ordered vehicle today. Thank for your efficient and friendly services. I am pride of your know-how in your business network, so because everything has been well done. It takes time, however my shipment purchased recently from Japan arrived today at the right destination. I wish to thank you for the vehicle i recently received from you.The Prado is in good condition and promising to last. Thank you very much with your fast action! Your customer service is just amazing! Have a great day and Once again thanks you so much! This is to inform you that The Vessel DON Pasquale arrived in Dar es salaam as scheduled on 23rd of June 2014 and by the end of the month the car was cleared. Again, Diamond Shipping Agent helped me a great deal. I am now driving my dream. The car is in very good condition and nothing is missing according to the inspection report. I once again say thank you so much for your assistance and cooperation. I hope I will come back when finances allow. Stay Blessed and continue with your hospitality.